New data from NASA's Chandra X-ray Observatory may provide clues to how quasars "turn on." Since the discovery of quasars over 40 years ago, astronomers have been trying to understand the conditions surrounding the birth of these immensely powerful objects. An artist's illustration depicts a quasar in the center of a galaxy that has turned on and is expelling gas at high speeds in a galactic superwind. Clouds of hot, X-ray producing gas detected by Chandra around the quasars 4C37.43 (shown in the inset) and 3C249.1, provide strong evidence for such superwinds. Credit: Illustration: NASA/CXC/M.Weiss; X-ray inset: NASA/CXC/U.Hawaii/A.Stockton et al. "The X-ray features are likely shock waves that could be a direct result of the turning on of the quasar about 4 billion years ago," said Alan Stockton of the University of Hawaii in Honolulu, and lead author of a report on this work published recently in The Astrophysical Journal. 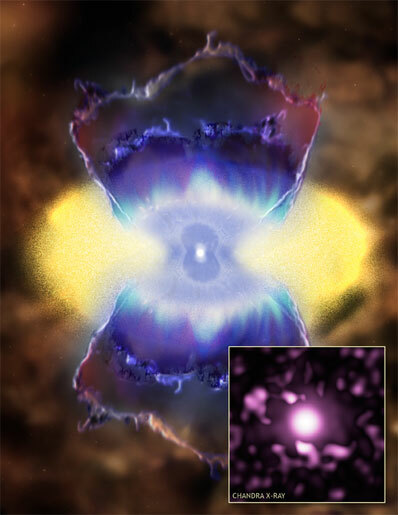 The quasars, 4C37.43 and 3C249.1, showed no evidence for the existence of a much larger envelope of hot gas around the features, nor were the observed X-ray regions associated with radio waves from the quasars. These factors rule out possible explanations or the X-ray emitting clouds, such as the cooling of hot intergalactic gas, or heating by high-energy jets from the quasars. "The best explanation for our observations is that a burst of star formation, or the activation of the quasar itself, is driving an enormous amount of gas away from the quasar's host galaxy at extremely high speeds," said Hai Fu, a coauthor of the study who is also from the University of Hawaii. Other members of the research team were J. Patrick Henry, also of the University of Hawaii, and Gabriela Canalizo of the University of California, Riverside. NASA's Marshall Space Flight Center, Huntsville, Ala., manages the Chandra program for the agency's Science Mission Directorate. The Smithsonian Astrophysical Observatory provides science support and controls flight operations from the Chandra X-ray Center in Cambridge, Mass.